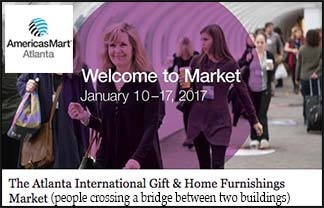 AmericasMart Atlanta, the home of the Atlanta International Gift & Home Furnishing Market, reported a VERY successful show in the article "Record-Breaking New and International Buyer Increases at Atlanta Winter Market". And, that was easy to believe that attendance was up, "WAY-UP", from the previous years because the showrooms and temporary booths were crowded with buyers and the reps were busy, "REALLY-BUSY", taking orders. Of course, it was slow going with so many people moving down the corridors, through the showrooms and booths, using the elevators (forget that) and escalators, and standing in line to purchase lunch or use the restrooms. And another drawback I found with so many buyers attending the show was that two of my appointments with art directors were cancelled. The art directors were needed to help show products and write-up sales so they did not have time to look at art. But, all of these inconveniences were worthwhile because a successful show means the likelihood of a successful art licensing year. The Atlanta show is all about product and viewing it is mind-blogging as you walk down corridor-after-corridor on floor-after-floor in the three buildings. So it is not always easy to determine what type of products/art/colors are trending. But, according to the articles I read, "United we stand - made in America" label is stronger than ever. Also, pet related, coastal, words/inspirational phrases, and of course Christmas products is huge. 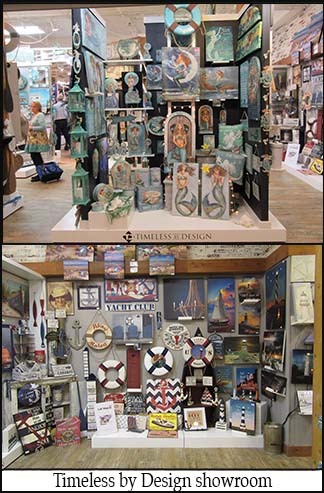 The article "Direct from Atlanta Market: Excitement Fills the Air at Americasmart" stated that " . . . there is a growing demand for fashion and personalization, and retailers and consumers are wanting more." A new direction in the decorative flag industry that will be seen in 2017 by several flag companies is state and even city themed flags that will increase flag sales. Because many flag manufacturers now produce their own flags in the United States, they can do print-on-demand short production runs with names of cities or states on them that is not feasible for companies that outsource their flags to China. For example, retailers will be able to order not only decorative flags with the VERY popular word welcome on it but will be able to order "Welcome to (city/state name)". In the article "Holiday Decorating Tips", Studio M said that ". . . retailers can expect to see some state-themed products from Studio M at summer markets in 2017". Art themes that started as a trend and have proven over time to be consistent sellers of products are considered to be evergreen (timeless). These themes are seen on all kinds of products. They include flowers, birds, butterflies, cats, seashells, lighthouses, roosters, pumpkins, fall leaves, turkeys, Santa Claus, snowmen, snowflakes, Christmas trees, pinecones, poinsettias, and reindeer. Not surprising, last year's huge fad of adult coloring books were not prevalent this year at Atlanta. Although coloring books and other products that can be colored are still selling well for some manufacturers. Chevron and Polka-Dot designs are still popular and are not only used as standalone designs but are now incorporated into art. At Atlanta these two designs plus plaid and gingham were prevalent on kitchen products. According to Gifts and Decorative magazine in the article "Direct from Market: Trend Spotting at Americasmart" trends include stylized geometry on jewelry and fashion accessories, bringing the outdoors-in with the coziness of Hyyge (Danish meaning "well-being"), whimsical images of ice cream, millennial pink color throughout all product categories, coastal, personalization of products, and more. Below are pictures and discussions on 2017 Pantone Color of the year and the widespread trends of words/phrases, coastal, and Christmas art that I saw at Atlanta. At Atlanta I attended Laurie Pressman's (vice president of the PANTONE Color Institute) presentation “Home 2017: At a Crossroads for Color + Design”. 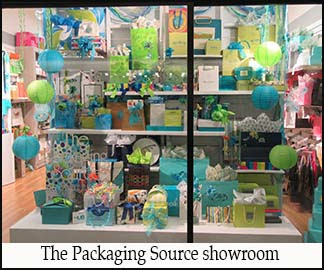 She stated in her presentation that color influences 50 - 85% of product purchasing decision. Product purchases also depend upon experiences and yearning for familiar comfort. The way consumers purchase products has change because of technology and type of expected service. The speed in processing so much information has made consumers want to pare back the clutter (less is more) resulting in the popularity of minimal color (white on white, dusty pinks); versatile, tranquil, stable, chic and sophisticated grays; warm browns; and luxurious reds. And, the importance in well-being has lead to nature and the desire to rejuvenate and revitalize resulting in Pantone's 2017 color of the year "Greenery", a zesty yellow-green shade of green. Note: Pantone 2017 color of the year "Greenry" has been trending for years on paper products, tabletop, gifts, home accents, and whimsical Christmas decorations. And now it is also trending on fashion and home furnishings products. Inspirational, religious, and humorous tongue-in-cheek phrases are still going strong. 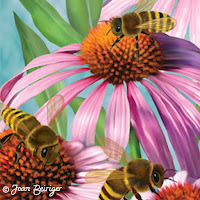 Most products are brightly colored or black and white wall art and greeting cards. More prevalent this year are words and phrases on kitchen décor and accessories. 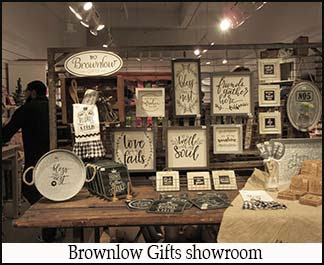 Brownlow Gifts showroom at Atlanta usually showcases very colorful products but this year they were black and white. When I questioned the Brownlow rep about it, he said that these B&W products with inspirational words and phrases are huge sellers. They make great gifts because the consumer does not have to worry that the color will not fit the home décor of the recipient. B&W kitchen products were also in other manufacturer showrooms. Coastal and beach themes were very strong last year at Atlanta and it was even more so this year. Gift and Dec publication article "Direct from Market: Trending Spotting at Americasmart" stated that "According to our Gift Book consumer survey for 2017, 8 percent of consumers describe their home decorating style as coastal, up 2 percent from the previous year. If Atlanta is any indication, this number will only continue to rise." The majority of showrooms at Atlanta had a coastal line no matter what kind of products they sell. Last year mermaids were the outstanding icon and they were even more so this year. Mermaids were on stationery, pillows, flags, rugs, jewelry, totes, tabletop, home décor, plush and even zip-up throw blankets with mermaid tails. Whale images are also very popular and the popularity of flamingos seem to be increasing. Seashells, seahorses, starfish, crabs, lobsters, octopus, and sea turtles are still a stable in the coastal line although they seem to be going neck-and-neck in popularity with ships/boats and their accessories such as ship wheels, anchors, and lifesaver rings. Ships/boats and accessory products and images tend to use red, white and ultramarine blue colors. While, the background color or portions of the art in other coastal art often use turquoise OR ultramarine blue on white/ivory colored background. 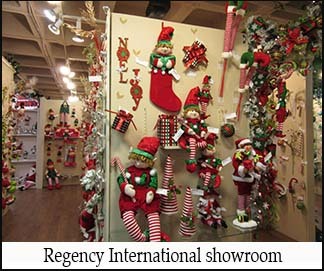 As usual, Santa Claus, snowmen, angels, reindeer, polar bears snowflakes, pinecones/pine-nettles, poinsettias were prevalent in the Atlanta holiday & floral/home décor (H&FHD) showrooms plus the many gift showrooms that have Christmas lines. Not so prevalent were amaryllis flowers, nutcrackers, penguins, and woodland animals. At the Atlanta show during the last two years there has been an inkling that elves might start to trend because some of the H&FHD showrooms had elf figurine lines. But it was not until this show that whimsical elf figurines and art went viral and appeared in most H&FHD and gift showrooms that have Christmas lines. Note: The popularity of elves may be due to the recurrence of the popular "The Elf on the Shelf" children's picture book(s) that was originally published in 2004. As seen in previous years, traditional Christmas art and décor use deep red and deep green colors. Fun whimsical art use bright red and chartreuse green ("Greenery" Pantone 2017 color of the year). And, elegant designs use silver and gold. Red and black plaid designs and burlap textures are becoming more popular in Christmas art and décor. According to Studio M in the article "Holiday Decorating Tips" 2016 holiday décor had lots of black, white and red color schemes with burlap, muslin, and buffalo check. Natural elements such as birch, pinecones and antlers continue the trend of Nordic, woodland and forest themes. Studio M predicts that 2017 will be a derivative of 2016 with lots of white-on-white and green-and-white color schemes while textural elements and more woodland animal elements like antlers and snowy owls will continue. Note: The predicted 2017 trend depends upon the type of products. For example, white-on-white art may work for tabletop and paper products but not for decorative flags.